ASpedia provides a comprehensive functional impact database for human alternative splicing (AS) events. Our database encompasses genomic annotation, transcriptional regulation and its elements, and isoform-specific functions. Genomic annotation associated with the functional impact of AS were investigated from DNA, RNA, and protein sequences. Large-scale transcriptional regulation and its element were also integrated. The dataset of isoform-specific functions was specialized in protein-interaction and subcellular localization. 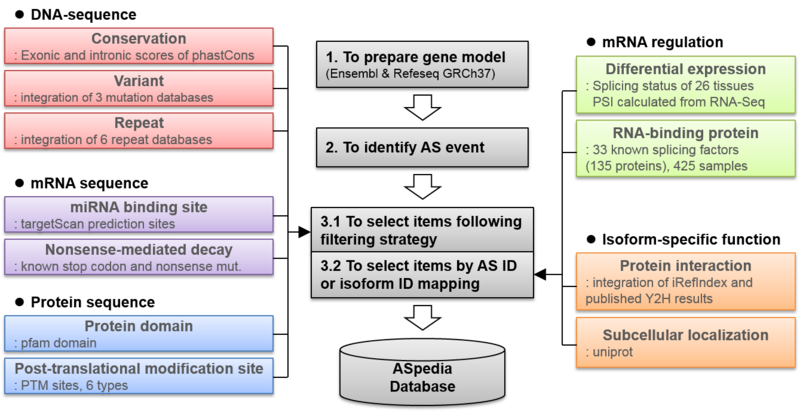 ASpedia annotates the functional impact of alternative splicing (AS) event and the system supports retrieval system and browser for visualization. Our database includes known and novel features associated with alternative splicing region. In order to search multiple AS events, ASpedia provides file-based high-throughput query and gene name search. Input file could be converted from RNA-Seq AS analysis result. The converter could be supported in this web site. Final search result is also downloadable as a tab-delimited BED file format. We support total pipeline example in util page. 2017.6.30. Welcome to ASpedia! First release of database version 0.1.